Does reaching overhead; brushing your hair or putting on your seatbelt cause you shoulder pain? Have you lost strength in your arm suddenly? Are you waking up in pain after sleeping on your shoulder? Is your shoulder painful when swimming, playing tennis or golf? These are all common and often debilitating symptoms of shoulder conditions that if left untreated will progressively deteriorate further. 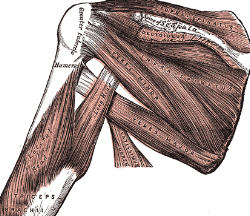 Shoulders can be quite complex due to the amount of movements available at the joint; this can cause the joint to become unstable and susceptible to injury. We use our shoulders for many day-to-day tasks. Once pain or injury occurs, it can be very frustrating and incapacitating, making our day-to day activities painful and sometimes impossible. Shoulder injuries often arise due to weakness and instability within particular muscles surrounding the shoulder. Myotherapy can assist with most shoulder conditions by firstly locating the source of your pain. Treatment is then structured around this with the aim of decreasing pain, improving flexibility and range of movement, and strengthening to restore shoulder function. Do you get pain when lifting your arm out to the side or overhead? Are simple daily tasks such as brushing your hair, doing up a bra strap, gardening or reaching for something in the cupboard becoming more and more difficult? Treating shoulders is a special interest for Myotherapist, Kerri Layton at Myotherapy and Movement Clinic. Myotherapy and Movement Clinic is located in the heart of Camberwell Junction. In addition to Camberwell, we service the surrounding areas including Hawthorn East, Hawthorn, Glen Iris, Malvern, Malvern East, Toorak, Canterbury, Kew, Mont Albert, Surrey Hills, Balwyn and other areas in the Inner East of Melbourne.